Courgetti and alternatives to pasta have become extremely popular recently. 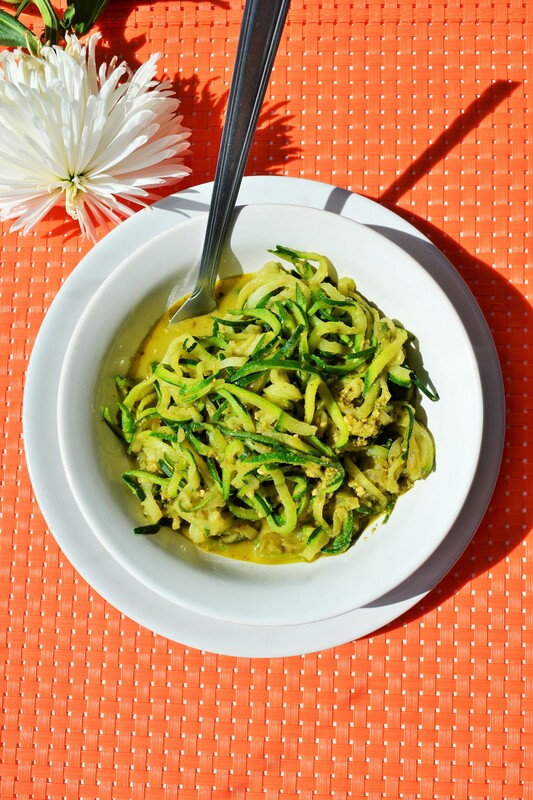 This recipe for courgetti noodles with pesto is delicious : an alternative to pasta that is easy to make and perfect hot or cold! – 500 g spiralised courgette. You can do this at home with a spiraliser or buy pre-prepared courgetti from leading supermarkets such as Tesco. – 1 large bunch of basil,washed. – 2 teaspoons pine nuts. – 1 tablespoon parmesan cheese. 1. To prepare the pesto, crush the garlic in a garlic crusher and add salt and a small pinch of pepper. Add this to a food processor along with the basil leaves, cheese, olive oil and pine nuts. Pulse until even. 2. In a pan, Lightly stir fry the courgetti until tender for 3 minutes. 3. Add the pesto mixture and stir through on a low heat. 4. Serve and enjoy hot or cold!